Neil talked about the need for electricity. 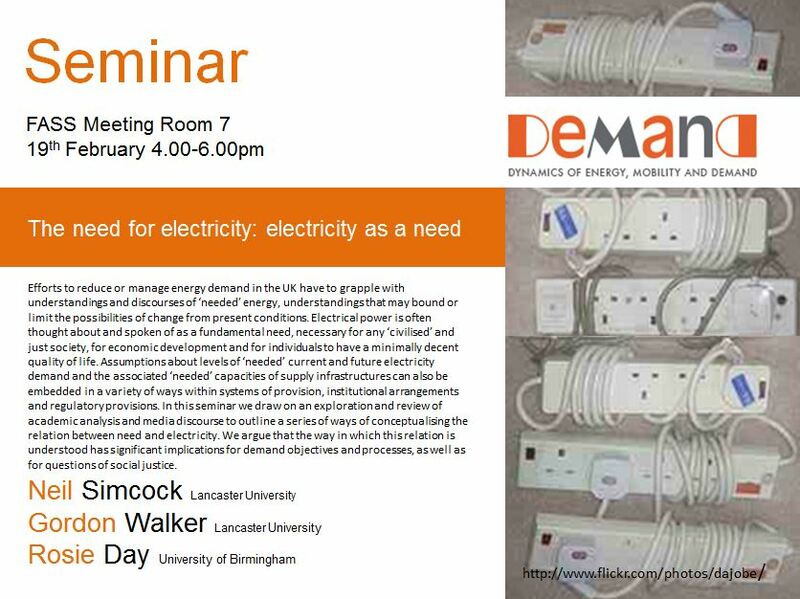 He approached the topic from three angles, first noticing that in much public debate/media concepts of need and demand are used interchangeably: if electricity is called for (demanded), then it must be needed. Hence the ‘need’ to keep the lights on, etc. This indicates that in popular and policy discourse there is no serious discussion of need, and no place for such a discussion either. The next step was to consider a selection of views about the nature of fundamental needs – for instance, human needs for well being etc. – and to reflect on where electricity might fit. This called for a distinction between the needs themselves and how they might be met or satisfied. Neil suggested that electricity has become so embedded in society that to an extent people do, fundamentally, ‘need’ it in order to participate effectively. His third move was to refer to the literature on relative poverty, recognising that peoples’ interpretations of normal and necessary goods and services change over time. The discussion addressed a range of topics: for example, how did these three ‘framings’ of need relate to each other, and what different theoretical baggage is associated with each; how to account for the more and less deliberate making of ‘needs’ (e.g. by commercial and other organisations); what about the relation between electricity, the means to use it, and wider infrastructures (thus how to discuss the need for electricity in the abstract); and finally whether to address the individualism of all the approaches that were discussed – that is the view that ‘needs’ are properties of individuals – and is this in any case a problem. This entry was posted in Seminars and tagged electricity, seminars. Bookmark the permalink.